Transitions are overwhelming. Divorce is a transition, moving is a transition, and changing jobs is a transition. Do you want to handle your current transition better than your last transition? The good news is that anyone can learn skills to calm transition-related panic. Let me share with you a framework that has helped me calm the panic in times of transition, anxiety, and overwhelming change. Taking a moment to think about a previous transition in your life is helpful for calming nerves quickly. 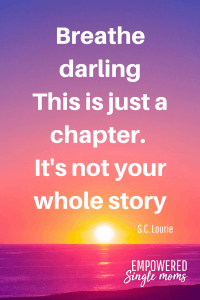 It may not have been as dramatic (or may not seem so in hindsight) as the one currently in front of you, but chances are you have been through a transition before. For example, if you have been through the transition from student to worker, you have some experience putting order to the chaos of going from one way of life to another. And you survived. You will survive this one as well. Another mom recently shared with me that her son was near panic at figuring out how to finish college, decide what to do next year, and make it happen. If you have a child or a young friend facing this challenge, show empathy for him or her. Recall your first huge transition into adulthood. Think back the last part of your senior year of college. You were trying to finish your school work and decide about work or maybe graduate school. Where would you live? What would you do? Would you get a job in your chosen field? In the midst of this, you were probably saying goodbye to some special friends as you all prepared to go to your first real adult jobs. You may have been making the decision whether or not to marry your college sweetheart (or even your high school sweetheart). If you had a job, it was most likely a part-time, for-now sort of job. After college, jobs are a full-time, semi-permanent deal. It’s a leap into an unknown realm. No wonder many young adults feel as if they are facing lions, tigers and bears! Oh my. Advise your young friend that although you probably felt panicky at times when you were in their shoes, you made it t to the other side more or less successfully–and they can too. You, having already gone through at least one huge transition (two, if you are a parent), are the voice of experience. When there are so many things to do and many of them are things we do not know how to do or have little experience with, life seems overwhelming. Some transitions, like divorce, take longer than others. Focusing on one thing at a time can calm panic and overwhelm. Start by making a list of what needs to be done. If you must, you can make a list of what you want to get done. However, a master list of what must be done to get to the other side of this transition is the key. Now, look at your list and decide what you need to do first. If you are having trouble making the decision, remember food and shelter are the two most basic needs, followed by transportation. Once you know what needs to be done first, break that task down into small steps. For example, if you need to move, first create a budget and determine what you can afford. Second, search for housing within your budget. Once you have found a place to live, you can move on to the tasks of packing and moving. The mom of the young man who was near panic about graduating college told me he calmed down immensely when he wrote down what he needed to do and then tackled one thing at a time. What If You Need to Change Jobs? If you are going from a student to a worker or a stay-at-home mom to a worker away from home, think about what needs to be done. First, assess your skills and interests. What Color is Your Parachute is a great resource for exploring your career path. Then, update your resume and start applying for jobs. If you do not want to work away from home, there are many jobs for work-at-home moms. (Stay tuned for more on career exploration in future posts.) Once you know the type of work you want to do and your resume is polished, start applying for jobs. Remember, you have probably made at least one, and probably more than one, major life transition. You know you can do it. Remember what worked well and what you want to improve on during the next transition. Make a list, prioritize, and then break it into small steps. Do not worry if you don’t have the process perfected yet. You will get another chance. Life is full of transitions. Do you need a little boost? Check out 4 Inspirational Quotes That Guide My Life. 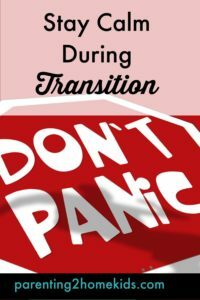 If you found this framework helpful for calming your panic during transition, please share it. What transitions have you been through? What helped you?